Within my Retirement Investing Strategy I currently hold 5.5% (up from 4.1% at the last USD gold update) of my portfolio in gold with a targeted holding of 5%. Gold is the only portion of my portfolio that does not provide a yield (dividends, interest etc). 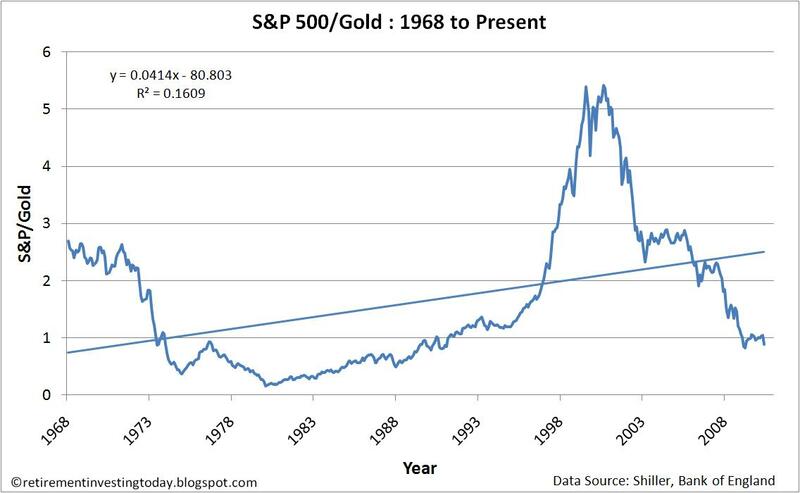 The first chart shows the updated real price of gold since 1968, with the wild ride that comes with gold obvious. This month the real (after inflation) price of gold has risen by about 4.3% to $1,200.20 per ounce at the time of writing. 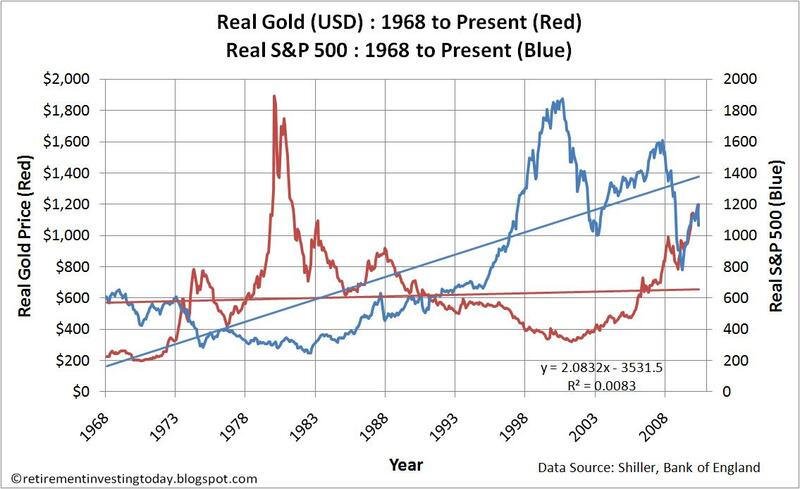 The trend line however suggests a real price today of $656.60 and the historical average real gold price from 1968 sits at $612.60. So by both of these measures gold still appears overpriced. 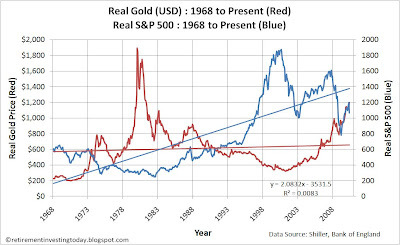 The correlation between the Real S&P 500 (also displayed on the first chart) and real gold moves from -0.32 to -0.31. The second chart provides the ratio of the S&P 500 to gold demonstrating just how far apart the two can vary. Today this ratio moves from 1.04 to 0.89. The trend line however suggests a ratio today of 2.43 and the historical average ratio from 1968 to today is 1.62. So this measure would suggest that if you were looking to choose to buy the S&P 500 or gold then the S&P 500 might be the better option. The final point to make however is that while both the first and second charts suggest gold is overpriced on historic measures I cannot forget that in 1980 gold reached an average real monthly price of $1,895.59 which is a long way above where we are today. - Last Gold price actual taken on the 25 May 2010 during trading. - Last S&P 500 price actual taken on the 25 May 2010 during trading. Can I ask why you want to hold gold, diversification benefits aside? If you are willing to take some volatility (which anyone with a long-term investment horizon should) the surely investing in some income generating assets would be a better way to go, given that gold hasn't really held its value over time? Diversification benefits are exactly the reason I hold gold. Have a read here http://retirementinvestingtoday.blogspot.com/2009/12/building-my-low-charge-investment_04.html where I explain in a little more detail plus show a couple of charts.